With today’s release, we are unveiling some exciting map updates, and are ready to more formally and more widely announce this project. Read more next week in the Geocaching newsletter and Geocaching Blog. First things first. Over the past 9 months or so, we have automatically opted in players to the new map experience. 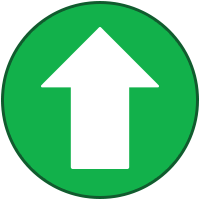 We haven’t opted in all players just yet; instead, we are doing a slow rollout out to assess feature adoption and the overall reception from the community, as well as ensuring our new map and search services here at HQ are up to the task of handling all the new traffic. As you pan the map, a new “Search this area” button will appear allowing you to fire off a new search on the map. If you click into the cache details page from the cache preview, simply hit the “back” button to return to your search. New map: collapsed side panel for full-screen map viewing. “Search this area” button is visible. New setting allows you to select how many caches to show on the map at one time. The default is 500, but you can view up to 1000, and as few as 250, depending on your desired experience. Access this Settings modal view from the gear icon directly from the map, then select the number of caches you would like to see. We switched from raster tiles to vector tiles. (These are the tiles that power our map). A benefit to implementing vector tiles is that they provide future flexibility with respect to styles, features, and attributes. Search the world - This removes all location constraints from your search. For example, “Show me all of the Webcam Caches worldwide.” Toggle this on directly from the filters panel. Map filters and sorting accessible right from the map. Also filter by caches in a GeoTour. Default sort is by distance (near to far). You can also choose to sort by Favorite points, difficulty, terrain, size, found date, and placed date. View a cache details preview without leaving the map. Quickly access the description, hint, activity logs, last found date, difficulty, terrain, and Favorite points. Access and take action on the following: log the cache, add to a List, download GPX, send to Garmin, and open full cache details. Right click on any cache pin to quickly log the cache, add to a List, download GPX, or open the cache details in a new tab. View the event date in the cache preview list for Event Caches. Add geocache to List*, Download GPX, Send to Garmin, all from the side list panel on the map page. 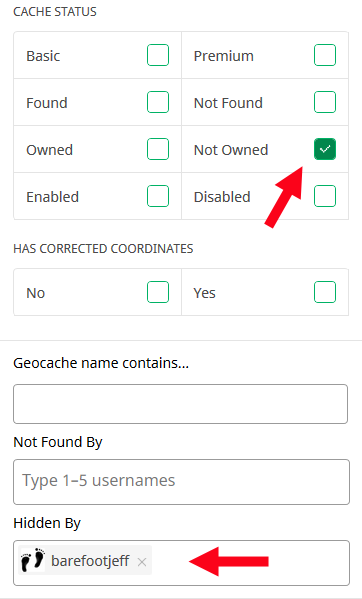 Select the URL to share an exact map view when a cache is selected. Select only specific caches from the side list panel and add them to a List* all at once. *Lists are a Premium member feature which sync automatically with the Geocaching® app for easy trip planning. Maps are the heart of geocaching. As we make further improvements, we promise to explain the changes in this forum so you can take full advantage of the new map experience! How will I be able to skip the map and see my search results in a list view? Hi @k13. Great news! You don't have to "skip the map". From the home page, begin your search by entering your desired search term, then you will see your search results in the list view you are accustomed to. Then if you'd like, you can map your results. Will I also be able to go straight to the map, as I current do 99.5% of the time I open the website for caching? (I never use search but...) I went Play, Search, my city, hit the magnifier, see a list and blue banner. Hit "Go to new map", and ended up back at roughly the same place. A list, not a map. Hit the magnifier a few times, still a list. Eventually found a very tiny icon* that looks like a map. I've unlocked the next level! First impression: still only three map choices, and only one of them OSM? Sorry, I won't use this. Please don't disable the direct-access classic map (eg via cache page) until you move the map options over. I explained the needs in an earlier thread. Thanks. Second impression: laggy. Swipe twice expecting to pan twice. It pans once and does nothing once. (Needs a break to think.) Repeatable. This is a showstopper. Shows promise, but needs work. Current Firefox on Android 7, Samsung Galaxy S2 tablet (2k+ screen, fast) , hotjar and facebook (!) scripts disabled. * I was in portrait mode. 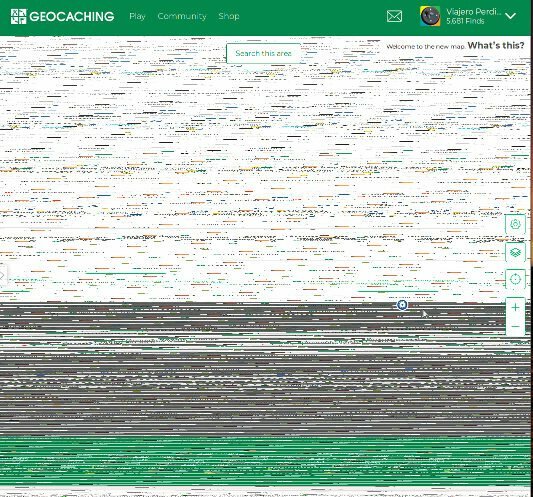 1536 pixels wide isn't enough room to show the words "Map These Geocaches"?!? I've found a bug on my very first attempt at using this latest incarnation. I go to Play - Search, click immediately on Filters then set the filter to Caches I Own. This gives me a list of 41 caches, so far so good. I then click on Map These Geocaches but get a DNF even though the area mapped includes some of my hides. If I then click on Filters, I find that it's set to caches hidden by me that I don't known. No wonder it didn't find any! I get a feeling of inconsistency with the text styling. There's a mix of dark grey and black text, but there doesn't seem to be a logical reason why some text is black vs grey. "Download GPX" in the left window looks like it's greyed out, as if it is unavailable. I'd prefer for all the text and labels to be black. I'd like to see "More info" open the cache page in a new window, rather than in the same window - especially since it's not possible to use the right-click 'open in new window' option from the left pane. Clicking on a specific cache and then going "back" to the results takes quite a bit of time and I'd imagine more resources as it shows "Loading geocaches" when going back. D/T/Size and Favorite Points could be displayed without using so much screen real estate. I suppose the goal is to mimic the app, but even there the FP's are not below the D/T/Size. Tightening up some of the vertical space, as in the mock-up below, would allow the most recent log in Activity to be visible without having to scroll. I think this is a great improvement, but what I am currently missing on the map is a scale and the openstreetmap maps, since the geocaching map still has a lot of potential for improvement. The traditional map at https://coord.info/map works fine as usual. Whew. The new map is a lot more resource intensive (on the client side, but probably also on the server side). My browsers are by far the most resource intensive applications I have on my computers. Not even debugging a large application in Visual Studio can come close to a Chrome window with Facebook and a couple other tabs. This seems to be the way geocaching.com is taking too. I'm wondering if the new map uses WebGL to process the graphics. For a while, sites like Google Earth (web version) and REI's Hiking Project, which use WebGL wouldn't display on my machine because the hardware requirements were outdated for WebGL. When the new Geocaching map came out, it wouldn't display for me either, but I didn't get the usual "your hardware doesn't meet the minimum requirements to display WebGL content" message. Instead, I just got a blank white page. Oddly enough, the map did work in Firefox and Safari, so I'm not sure if it was a WebGL issue at all. But a few weeks ago, Chrome updated, and the new map suddenly worked. Coincidentally, so did the web version of Google Earth and The Hiking Project. So now I'm back to my original hypothesis - that the new map is using WebGL, and maybe the fine folks developing WebGL reduced the minimum hardware requirements so that those of us using 10-year old hardware can access the content. Or it could be two unrelated issues that were coincidentally resolved around the same time. According to https://get.webgl.org/ my browser declares it supports WebGL, but apparently it doesn't do so properly. The spinning cube is all messed up. First time it's been an issue for me, well, assuming I planned to use the new maps. It would seem the new maps use/need WebGL - a good argument for keeping the classic maps around for a while. I really hope the old map get to continue to live. It's much smoother and faster to use, specially when moving around the map. Even with my auto-refresh-script, the new map is considerably slower use than the old map. The map controls are now in the middle of the right side of the map. This is an odd spot and not where the vast majority of maps put the controls. They should be in the corner where most users would expect them to be. The many alternative map backgrounds are missing. Until the "Geocaching" style matures, the others are still needed. When sorting by distance, placed date, or found date, the relevant data point isn't visible in the list. This makes those sorting orders largely useless. The map still has a limit of 1000 caches shown at any given time. There shouldn't be any limit. The "Search this area" button makes browsing the map very tedious. There should at least be an option to turn off this function and enable "live" loading. The Short Description isn't shown in the sidebar when a cache is selected. While it's understood that this field is deprecated going forward, existing Short Descriptions need to be shown, because they often contain important information for which the Long description can become out-of-context without. The container size text labels are in all-lowercase, which looks sloppy and unprofessional. The "More info", "View all N logs", and "Log geocache" buttons don't open the link in a new tab. The cache type icon isn't shown in the sidebar when a cache is selected. There's some small text, but this isn't sufficient to quickly remind one's self of the type of cache. The date of an Event isn't shown when the cache is selected, only in the list. In the list, the difficulty and terrain ratings aren't labeled, either with separate icons or text. For someone new, these would be meaningless numbers. There's hover/tooltip text, but this isn't sufficient. The "Back" button is separated both horizontally and vertically from the "More info" button. These are effectively opposite functions of each other and therefore related, so they should be styled similarly and be aligned vertically. The current placement of the "Back" button beside the search text field implies that one is going back from the search, but this isn't the case. The "Search the world" setting is confusing. If a specific region hasn't been specified, isn't this implied? Toggling this setting also doesn't seem to have any effect on the search. The most commonly-used filters such as Found/Not Found are too far "below the fold". These should be right at the top. A scale is missing from the map. This has been mentioned for quite some time and I know from personal experience that it's trivial to add with the Leaflet library (https://leafletjs.com/reference-1.2.0.html#control-scale). This field is now being used with event caches to show the start and end times, so in that regard it's been undeprecated. But please, it would be really helpful if you could say whether not displaying the Short Description field when you click on Description & Hint is by design or a bug that's going to be fixed, since if it's by design, I'll have to go through the laborious exercise of editing most of my existing caches to move the important information from that field into Long Description. I used to treat Short Description as being If you don't read anything else, read this! so it's a problem with it no longer being displayed. @brendanjw Thanks for the immediate reply of my first question. What about my second question? Will I also be able to go directly to the map, as I currently do 99.5% of the time I open the website for caching? I'm aware that I can currently use the familiar map, but what about next month, or in August? I thought you asked if you could get directly to the *new* map, like you could with the old. Sorry for misunderstanding. I fully agree. If the old map is lost, I see no reason to use geocaching.com anymore (just hope the Project-GC map is better than the new map here). It's where I spend most of my time on the site. And the new map is nowhere close to being able to replace the old map for me. It's too slow, and hard to use on high resolutions. 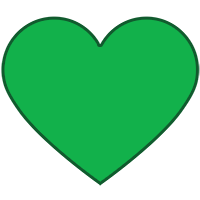 and hard to use on high resolutions. 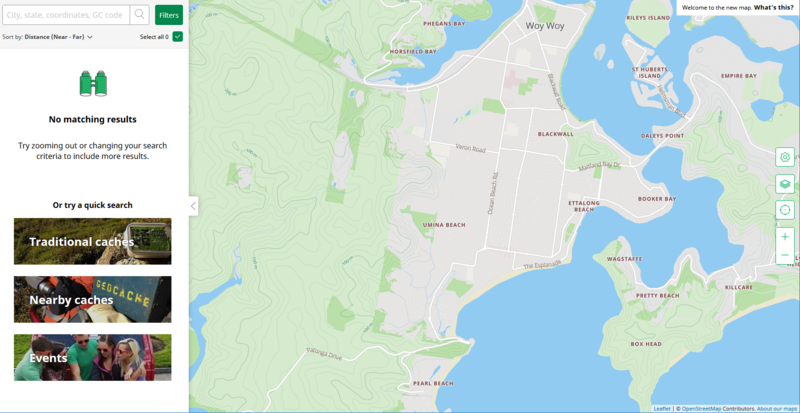 I would think the new map is easier to use on high resolutions (let's assume you've switched it over to Google Maps instead of the Geocaching Map). So many features of the side bar are space hogs that those high resolution retina displays would actually give you the proper real estate. It's not. It requires a lot more mouse movement than the old did to accomplish the same. And that's not a good thing. I'll just add that any speed issues with the new map are mostly with the geocaching map layer. When I switch the map over to Google Street Map, it becomes much more responsive. The map itself isn't that bad (but your comment suggests that the Google Maps layer doesn't use vector tiles). The issue I have is with the caches, and they load just as slow on the Google Maps layer, as they do on the Geocaching layer. Edit: Google Maps doesn't use vector tiles. I don't think switching to vector tiles was a good move. I haven't had any issues with caches loading slowly, and I'm using a 10 year-old computer. Though the side bar will take some getting used to. In the old map, when you clicked on a cache and then clicked on the link to its full page listing, it would open that up in a new tab. In the new map, when you click on the "More info" arrow button, the full cache listing is opened in the same tab, which means I need to page back to the map, or remember to command+click to open the link in a new tab. Could you set the default action for this to open the cache page in a new tab? www.geocaching.com/play/map is a 404 for me - but it doesn't matter because I won't use the new map at all - I never do searches. The ability of the old map to be used with hundreds of different special interest maps is essential to me. Some lists (e.g. https://coord.info/BM3PAFH ) bring up the map centred on the Bering Sea, even though all the caches on the list are in Europe. Dragging the map to Europe and zooming in seems to show the correct caches. This happens a lot with a number of my lists. I've also seen some lists bring up a blank page with no map displayed, and some bring up a map centred on the correct location but there is no cache shown on the map - though these seem more intermittent and I can't reliably reproduce them. Reverting to the old map displays all the above lists as expected. I've had some hit or miss attempts when launching map view from bookmark lists. Sometimes it works fine and sometimes it shows the correct area I should see but loads caches (found & not found) around my home location on the left, with no caches displayed in the area the map is displaying. When using Firefox (Version 64.0/64-Bit on Linux ) and set the cache limit to 1000 (Map Setting, How many caches should we show?) I will get an empty map for the next search (almost a white screen) and have no possibility to switch back the setting, because the controls are not visible. Chromium seems to work. After setting the limit back to 500 (with Chromium), Firefox was okay again. When I choose "Map List" from the "My Lists" (https://www.geocaching.com/account/lists), I see the map of the bookmark list for a short time (like a second) and then the map switches to the new search map, showing my last search result (Again Firefox version 64.0/64-Bit on Linux). I'm currently not able to view a map for a bookmark list (without creating a pocket-query for the list). I'm seeing a similar thing with Firefox 64.0.2 on 64-bit Windows 10. Trying to map a list. On a few of my lists it works correctly, but on others it'll show all caches near me in the left-hand panel with the map zoomed off to where the caches in the list are but with none showing; sometimes it'll zoom and position the map to show the caches in the list, and momentarily show them, then it changes its mind and instead both the map and the left-hand panel show all the caches near me. And on the ones it does display correctly, it appears to momentarily show all the caches near me before switching to the list. I haven't come up with a specific trigger. One of the lists I was actively using this weekend worked the first time I displayed the map but every time after it's not displaying the caches in that list. I think you have to Opt-Out first, or else going to the old map will not work. The opt-out link only works if you're currently using the new maps, if you're still using the old map then you will get the 404 error when you click the opt-out link - it's not very user friendly. Someone using the old map is already opted out, so that seems to make sense. Using the Opt Out link is only needed if someone is using the new map. I suppose it could be more helpful to have a link to the Product Test page instead, but not sure how feasible it is to display a different page for one 404 page vs another. Is Internet Explorer no longer supported? Or am I doing something wrong? Using the new map with IE, the "Geocaching" map does not display. I see only the cache icons on a grey background. Both Google maps display properly. Chrome works fine. Using IE I also do not have the "Sort by" option in the left panel. Chrome works fine. I have the choice of two maps with IE. The geocaching map only shows the icons on grey. The other is OK. So, we are probably both doing something wrong. @ratjam, do you have old hardware? If so, maybe check https://get.webgl.org/ to see if your hardware supports something called "WebGL". Groundspeak hasn't told us yet (that I can tell), but WebGL support seems to be a requirement of the new map, and (I suspect) will become a support headache. You can switch back and forth between the old and the new for awhile if you need to, but eventually the move to the new map will be permanent. This must be the worst sentence I have read in a very long while. Everyone I talk to fears losing the old map, and many of us depend on that map to plan our geocaching outings. It's fast. It's (almost) dependable. It shows way more than 1000 caches. It works with several different map tiles. This has nothing to do with not liking change. 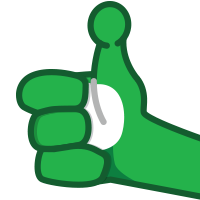 This has to do with not wanting to lose one of the best features of geocaching.com. The new map is great for mapping PQs, searches and lists. But it's nowhere near being able to replace the old map. Please don't take away the most valuable feature you have. I'm hopeful that lessons were learned from the mess that was the retirement of the old official app, where the old one was retired long before all the necessary features had been added to the new one. With something as critical to the site as the map, please make sure that every feature currently available is available in the new one before switching things permanently. As it stands right now, there are long lists of things that can't be done with the new map - both technically and in a workflow sense - as well as a number of outstanding bugs and style issues. Killing the ability for your users to identify the caches they want to find would be a surefire way to lose customers, so please take the time to do things right. The previously-used model of "roll out something that's barely good enough and we promise to make it better later" won't work here. If it means taking a year or two to get everything right, then so be it. There's no need to rush the project and risk alienating your customers. What I really miss (or haven´t found yet) is the possibility to create a PQ from this new map. It runs slow on my computer and every time I move the map or adjust the zoom, all the caches re-load from a center point outwards. It happens quickly, but that said when I load the old map it doesn't do this. Overall the old map seems much faster to me. No 'date hidden' or 'cache owner' info immediately available? I have to click on the page to get details like that. These are very important pieces of information that should be shown up front, IMO. Only 3 map layers? What about my favourite layer, the Thunderforest Landscape with its lovely topo lines and OpenStreetMap hiking trails? The Geocaching layer is not a suitable replacement for some of the Open maps; it really needs a lot of work to get to the same quality. As for the 2 Google layers, to be honest I never use the Google maps while perusing the geocaching map. I also find the Google satellite imagery ranges from bad to practically non-existent in some areas where I live and play (Canada). The Esri World Imagery is much better. Selecting "More Info" on the left hand side should open the cache page in a separate tab/window. The colour of owned caches (bright yellow with a star) looks an awful lot like the colour of found caches. They are hard to differentiate. I assume pressing "search this area" every time I want to move the map is simply an intended limitation on this new map feature. If not, yikes, that's very poor functionality. When I zoom out far and hit "search this area" it misses caches. I'm still not a fan of grey text on a white background. The difficulty, terrain and size icons are hard to read quickly. I liked how in the old map the unfilled stars were clearly shown. On the new map the unfilled icons are a very light grey and are very hard to see. The size icon is especially hard to read (all the sizes look pretty much the same). I'd rather just the text than the text and the icons. I like how when I clicked on a cache with the old map, the info popped up right above where I was looking. With the new map, and especially on a big screen, it feels more cumbersome to click on a cache on the far right of the page, then move my eyes and the mouse to the far left of the page to get the info I'm looking for. I would prefer an icon showing the cache type rather than grey text on a white background above the cache name showing the cache type. It's easier to read a coloured icon. Instead of selecting several caches and putting them on a list, is there a way to immediately put the selection into a downloadable GPX? That would be swift and easy! I like how I can pick out an individual cache from many when I'm zoomed out and there are a lot of caches around. Couldn't do that well with the old map. I like the filters. It's by far the best feature of the new map. Honestly without the filters I'd say this map is a big step backwards. I'd like to see attribute filters too, that'd be fantastic. And if there was only a way to filter out power trails...? The normal map still is there and that's exactly what I am using. I don't have any need for the search map as I simply don't really use the search functionality. I'm using the map and my filters are the PQs I defined. Just using the seach function in some rare cases to get numbers mainly. List is perfect then. Losing all OSM from the "browse map" (which you haven't touched - yet) would be a big loss. A single so-so OSM option with hardware requirements isn't much better. The new map is also based on Leaflet, so you can still get what you want with 3rd party user scripts. If I didn't have an excellent fallback on Android, and a new tablet with a gorgeously big screen, I'd be upset about this. But for me, it's simple. I'll just abandon this site's best feature. I'd like to see attribute filters too, that'd be fantastic. Attributes seem to have become taboo in this new search map - you can't see them without opening the full cache page and you can't search on them, yet attributes are one of the best ways of differentiating between a whole bunch of caches in an area, either to select particular ones I might be interested in or to rule some out (like tree climbs or climbing gear required if I don't like climbing). Isn't that what searching and filtering is supposed to be about? This is something I had thought about, but forgot to mention in my list of issues. In the new map, one needs to shift their focus completely away from where they clicked to see the result of their click. This might be acceptable when you're only clicking on a few and/or you know what you're looking for, but it's very user-unfriendly if you're browsing and clicking on a bunch of caches. Personally, given the demonstrated shortcomings with trying to squeeze all the necessary information into the sidebar (hint: it can't be done), I'd prefer to see the list in the sidebar stay as-is, and for cache clicks to open a popup within the map area like the old map does rather than display in the sidebar. This popup could maybe be made slightly larger to accommodate a modified set of data compared to before (but still include things like type, D/T, owner, placed date, FPs, etc. ), but still rely on users opening up the listing page to get all the relevant details like the description, attributes, and logs in the necessary context like they do now on the old map. This way, you still have the list in the sidebar for sorting and quick scanning, clicking on a cache in the map area doesn't require a shift of focus and gives a better summary of the clicked cache, and we don't have a limited set of data from cache listings displayed out-of-context in the sidebar. A side-benefit is that there's less data transfer required, because the data required for the popup will be much less than what's displayed in the sidebar, which is good for both users and HQ. I selected Google maps but it reverts to Geocaching maps after every session. Why doesn’t it stick? The Geocaching map is the default map. You can switch to Google anytime you would like and it will remain sticky throughout your session, but it will reset to Geocaching maps after you close your browser. That's an appalling backward step.